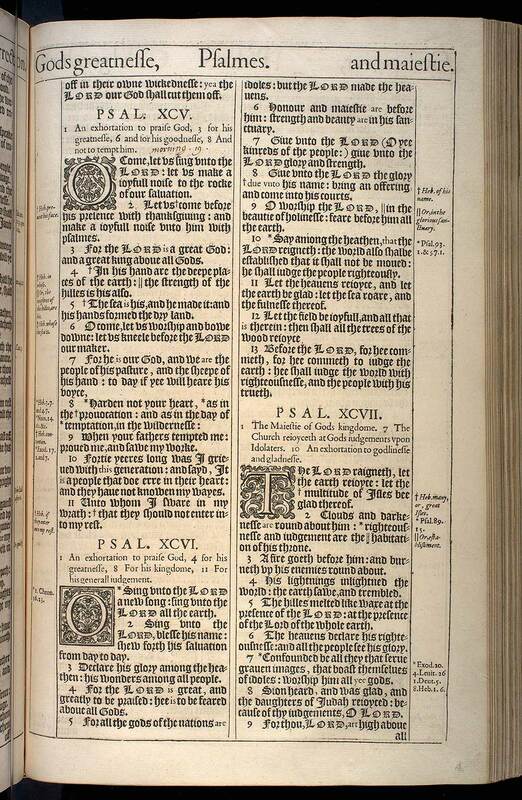 Viewing the 1611 King James Version of Psalmes (Psalms) Chapter 96, also known as: THE BOOKE OF Psalmes. , Psalms, Pslm, Ps, Psalm, Psa, Psm, Pss,. 1 An exhortation to praise God, 4 for his greatnesse, 8 For his kingdome, 11 For his generall iudgement. 2Sing vnto the Lord, blesse his name: shew forth his saluation from day to day. 3Declare his glory among the heathen: his wonders among all people. 4For the Lord is great, and greatly to be praised: hee is to be feared aboue all Gods. 5For all the gods of the nations are idoles: but the Lord made the heauens. 6Honour and maiestie are before him: strength and beauty are in his sanctuary. 7Giue vnto the Lord (O yee kinreds of the people:) giue vnto the Lord glory and strength. 11Let the heauens reioyce, and let the earth be glad: let the sea roare, and the fulnesse thereof. 13Before the Lord, for hee commeth, for hee commeth to iudge the earth: hee shall iudge the world with righteousnesse, and the people with his trueth. 8 Heb. of his name. 9 Or, in the glorious sanctuary. 10 Psal.93. 1. & 97.1.